Handwritten notes and letters are a rarity, which makes them that much more meaningful and cherished by the recipient. When you take the time to write a note by hand, it shows the other person that you cared enough to pull out the stationery and choose your words without the conveniences of the grammar tool, spellchecker and auto-fill! Written notes are also permanent, which means they’re often saved by the recipient and even shared with others. Before you begin, you’re going to need nice stationery. Business letterhead or a fold-over note card with the company logo on the front are fine to use for relationships that are just getting established. Once you have a closer working relationship with that colleague or client, you can switch to personal stationery. 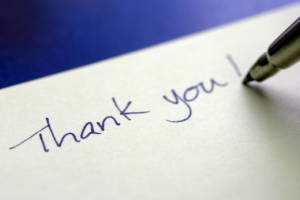 Do you really want your “thank you” email to be buried within the 300 they’ll receive that day? Your words will have real impact and you’ll stand out as someone with class and sophistication if you put pen to paper!